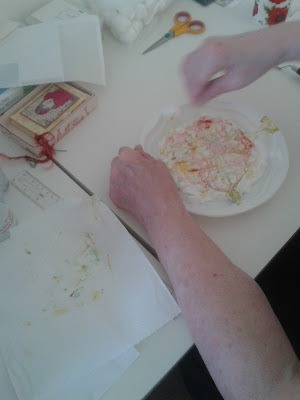 Yesterday I went to Margaret (Glitterandglue) for a play day, we had a wonderful time, getting very messy, and I'm sorry this post is rather picture heavy. 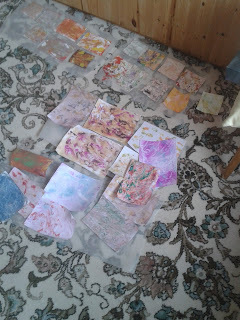 First we did some playing with shaving foam and and alcohol inks and acrylic paints, made lots of backgrounds, but at the end, neither of us was very excited, I can't see either of us repeating the exercise any time soon. 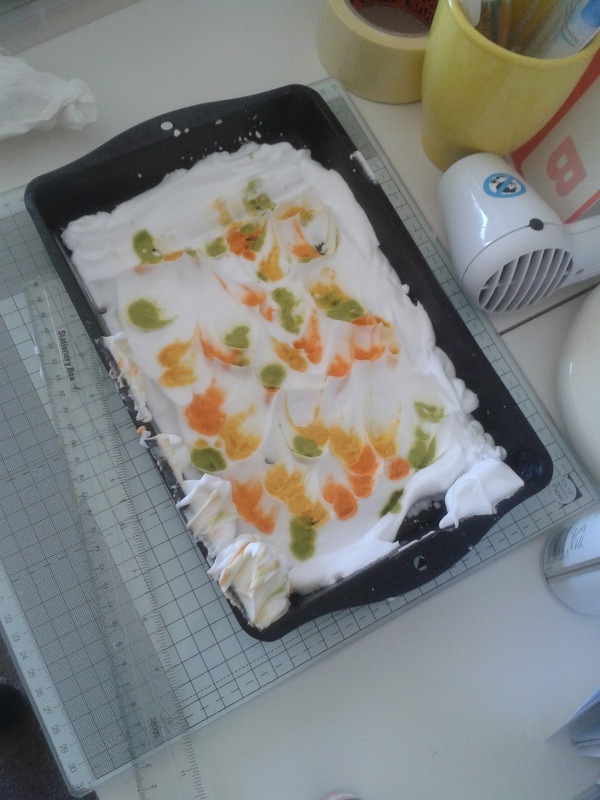 and here are mine on my work surface. I will probably only use two or three of these efforts. Then we had a go on my homemade Gelli plate, I've had it for about three years and never used it before, again, not really enamored and probably won't ever use it again. 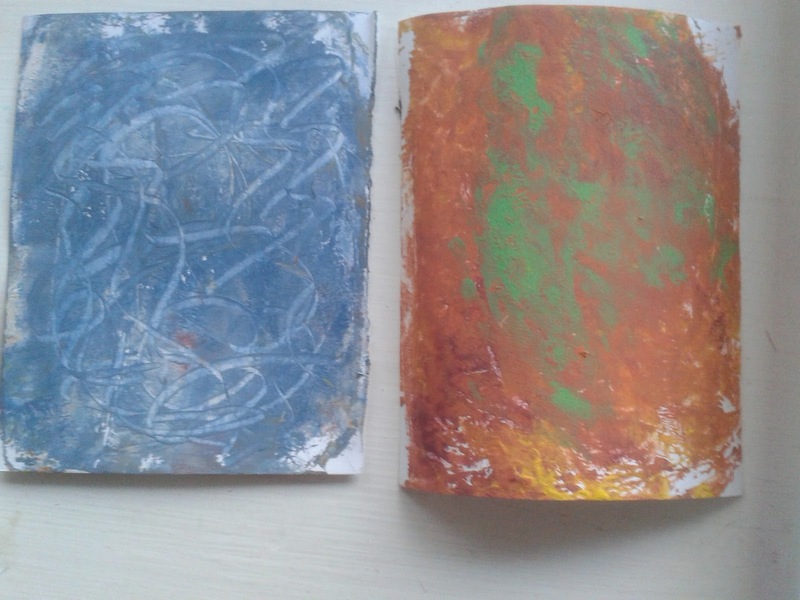 Don't think the end result was worth the effort, I might use the blue one but not the other one. Next we played with Margaret's Brushos and made a fabulous mess, that's when my hands got so mucky, we had a wonderful time, and I am seriously thinking of buying some of those. 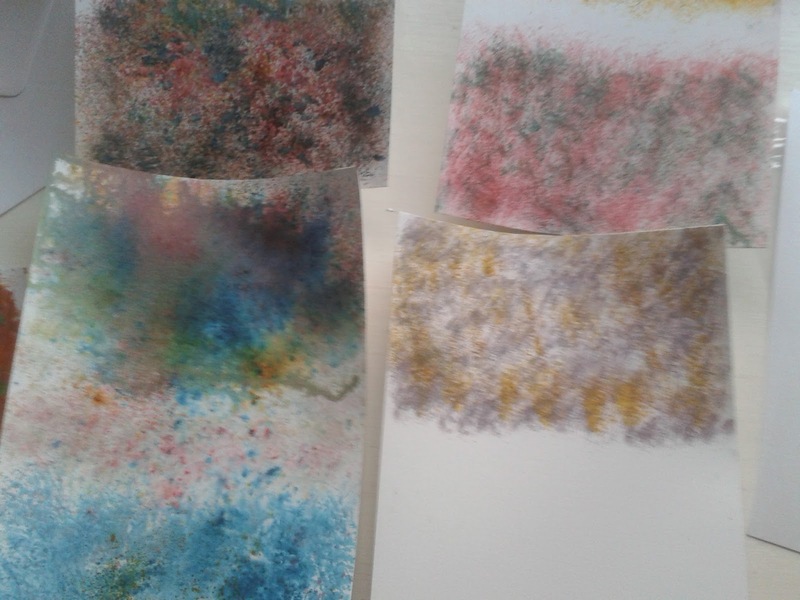 They are fabulous to use, here are the results of that play and I will probably use all of these creations in some way or other. 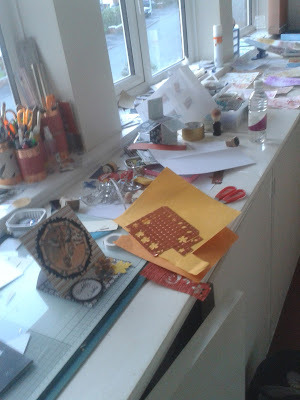 So, now as this blog heading is What's on my worktop Wednesday, kindly hosted by the fabulous Julia, and we are supposed to be baring our worktops at the Stamping Ground, I'd better show you my worktop. At the far end are all my creations from yesterday, and on the glass mat is a card I am making for daughter, with the Pollyanna Pickering DVD A Walk in the Wild, and in between, my trusty tool box. Well it is time I finished this or you, dear kind visitor, will never get to read it. Thank you for dropping by and wading through my drivel, and if you make a comment I will certainly return the favour. I like how you've made the different back grounds & now all ready to add some extra pieces. Love the "mess"! Creativity at it's best! My goodness, what a lot of creativity! Bet you had great fun with Margaret and John. Don't dismiss the backgrounds you don't particularly like - try diecutting some of them and see what you get . Must say I love the shaving foam technique and use my results of matting an layering, not sure about Gelli prints but Love Love my Brusho's. 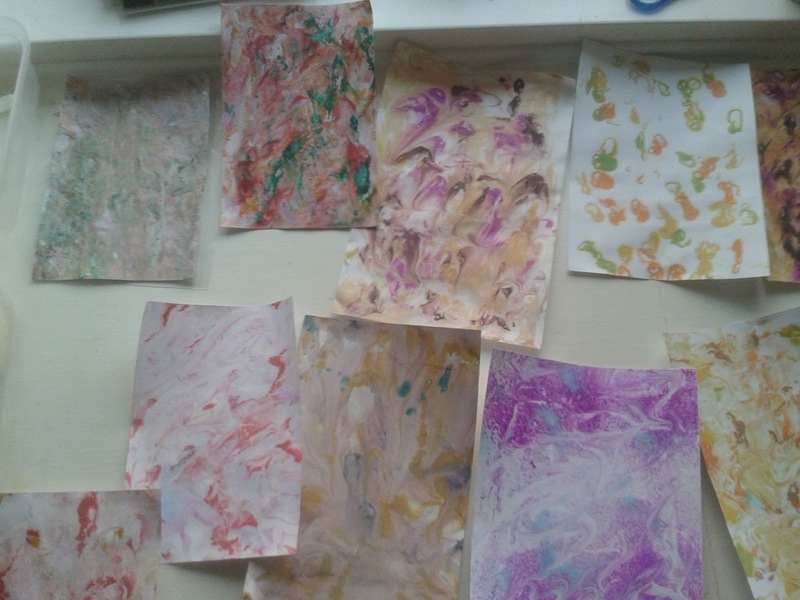 I did marbling using shaving foam, it was great fun. Must put it back on my to do list. Tee hee - almost identical blogposts this morning!! Great day yesterday. See you soon. But you have to have a go befor you know whether you like w technique or not...having fun with a friend is just the cherry on the cake 🍰 I never seem to get anywhere when I try and do random, it just isn't me...I do so admire it but don't seem to have the brain to achieve it. I'm glad you had fun with the Brushos though, lots of deserve seem to love them! Your play date sounds like a lot of fun - I think your papers are fab, although I don't know what the shaving foam technique is, it sounds intriguing! Gelli printing is a strange one - I find it either goes really, really well or it's a complete disaster! 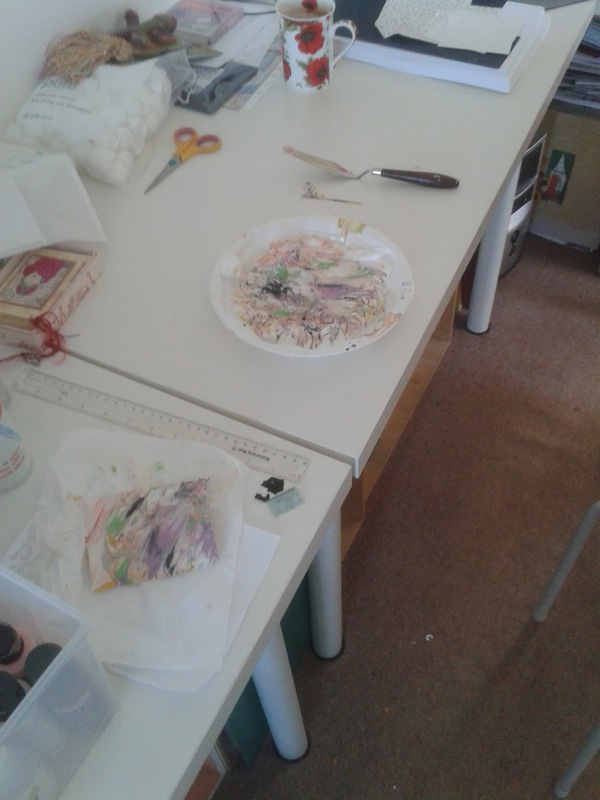 It's so lovely to see you having crafty fun with a blogging friend. I guess it's all a bit trial and error with new ideas....but well worth the effort. 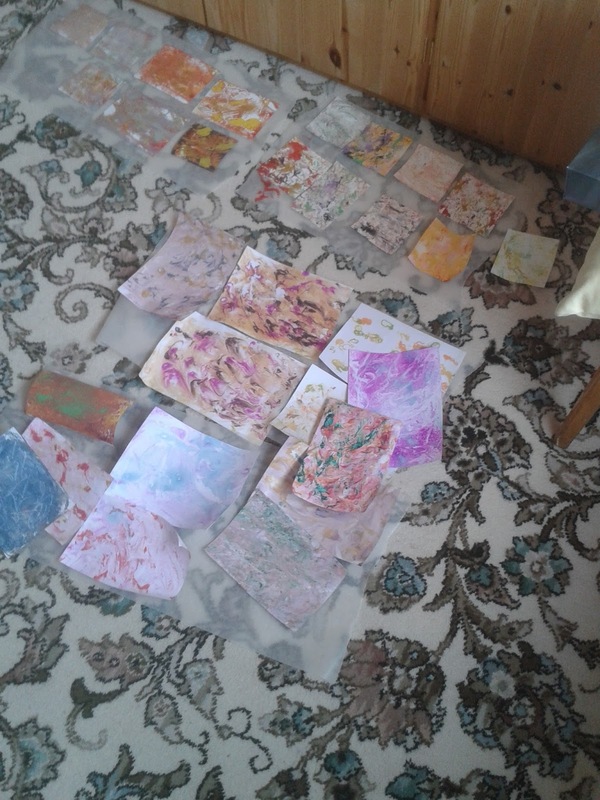 You look like you had lots of fun and got a lot of backgrounds done! 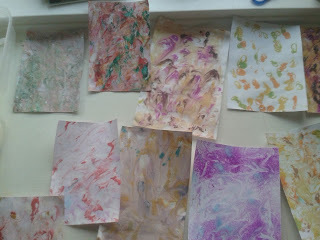 The shaving foam backgrounds look like something my school craft classes would enjoy - I've never tried that - it looks like fun! Lovely card - I'm sure your daughter will be pleased with it. Love those play days! Looks like you have a wonderful time. Your hands show it!! Sorry for the late post. 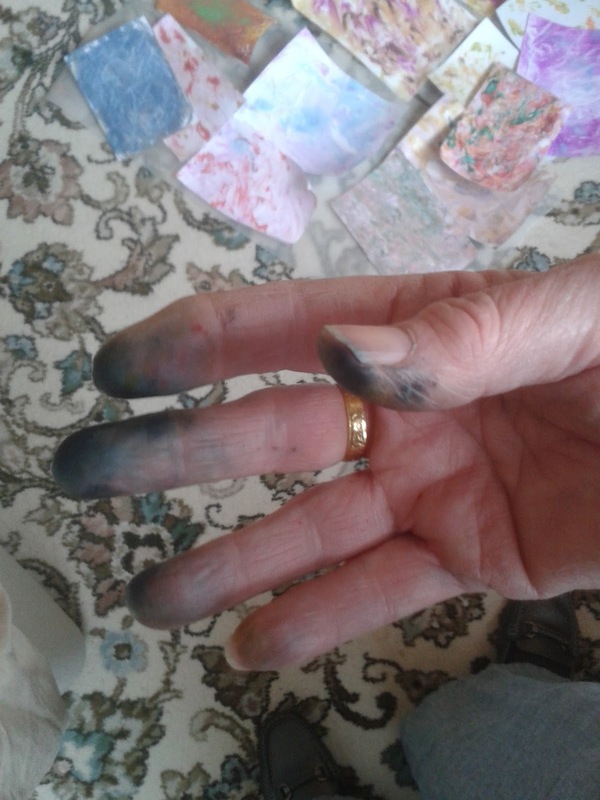 Happy Creative week to you! !